Mathis James "Jimmy" Reed (September 6, 1925 - August 29, 1976) was an American blues singer. His lazy, slack-jawed singing, piercing harmonica and hypnotic guitar patterns were one of the blues most easily identifiable sounds in the 1950s and 1960s. Jimmy Reed was born on September 6, 1925, in Dunleith, Mississippi. He was a blues singer and songwriter who played the guitar and harmonica. When he sang, he would slur his words. However, between 1943 and 1944 he left the south to head to Chicago to find a job because there were more job opportunities available there due to the war. He was drafted into U.S. Navy while there. In 1945 he was discharged and returned home to Mississippi briefly before once more traveling to the Chicago area. While working in the steel mills, Reed spent his leisure time with a friend named Willie Joe Duncan, who played the one-string guitar, or Diddley-bow. He also re-established contact with Eddie Taylor, who had moved north to try his luck. The two played together; Reed on guitar, harp, and vocals, and Taylor on guitar. Jimmy finally got the break he had been hoping for in 1953 when he secured a recording contract with VeeJay Records. Finally, he got his first hit in 1955 called "You Don't Have To Go." From then on, his success was incredible. "You Don't Have to Go," was followed by "Ain't That Lovin' You Baby," "You Got Me Dizzy," "Honest I Do," "Baby What Do You Want Me to Do," "Big Boss Man," and "Bright Lights, Big City." Much of his success can be credited to his friend Eddie Taylor, who played on most of his sessions, and his wife, Mama Reed, who wrote many of his songs and even sat behind him in the studio reciting his lyrics into his forgetful ear as he sang. His hits appealed to blacks and whites. Many of his blues songs were even adopted by white R&B groups during the early 60's. He was the first of the Chicago electric bluesmen to break through to the pop/rock market. Reed had fourteen hits for Vee Jay on the R&B charts between 1955 and 1966. Reed was an epileptic and this fact, plus his fascination for the bottle, constantly undermined his work. In the early 60's he visited Europe, but it was obvious that he was not well. Reed often appeared on stage drunk. 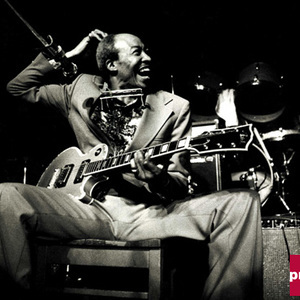 Jimmy Reed died on August 29, 1976 in Oakland California, because of respiratory failure. He was buried in Chicago. He was inducted into the Blues Foundation's Hall of Fame in 1980 and the Rock & Roll Hall of Fame in 1991. Steve Miller, The Rolling Stones, Pretty Things, and Grateful Dead acknowledge a considerable debt to him. Jimmy Reed was an important figure who influenced many artists.